The Arab Cuisine is perhaps one of the most sought-after cuisines in the world. And what better place to experience it than Dubai- the melting pot of culture-where different cultures have inspired its cuisine. Dubai has an international appeal for its architectural magnificence and its world-record breaker events, but it also some marvels around in the streets of the city. Dubai's street food scene is every traveller's dream. The Emirati Cuisine, as mentioned earlier is a blend of many other cuisines such as Middle-Eastern and Asian cuisines. Often streetfood in the city includes dishes from all around the world. Frequently used Ingredients include meat (such as chicken, fowl, and camel meat is used for a special occasion), grain, and dairy. On the other hand, many spices include saffron, cardamom, thyme, and turmeric. Let me just put it out here, no matter how well your local middle-eastern food outlet would make your shawarma; it just cannot be comparable with the authentic shawarmas found in the streets of Dubai. It is a non-vegetarian delicacy which has sliced chicken, lamb or beef (depending on what you ask for) and is served by rolling in a soft flatbread. It is filled with fresh vegetables, onions and various sauces that make the shawarmas something out of this mortal world. One of the undiscovered gems of Dubai that not a lot of tourists have discovered. It is extremely popular with the locals and can be easily found in any middle-eastern food joint. It is again a non-vegetarian dish with thinly sliced chicken pieces stuffed in the flatbreads. Filled with many spices, herbs, vegetables and pickles, the sandwich is a perfect combination of spicy and savoury. Oman Chips is an extremely popular and local chip found in the Emirates that form a concrete part in every child's childhood. Apart from the local groceries, supermarkets, hypermarkets, every schools' canteens used to sell these chips because it was highly requested by children and even the teachers! So, the hype around oman chips remains as it was. The Oman Chips Roll is a plain roll with layers of cheese spread and inside are the smashed Oman Chips. These perfect rolls are ideal for a long road trip. Harees is an Arab dish which is made from wheat and mixed with meat. Since it is a favourite dish, many variants are found in different parts of the Arab peninsula. Many like making it by boiling wheat whereas others make it with coarsely-ground wheat. Various countries like adding different toppings and spices in it. It is mostly served during Ramadan, Eid ul-Fitr, and Arab weddings. Ah! This hits home. India's famous snack Samosa is given an Arab twist with the famous Samboosa that is an ideal for a quick snack. It is thin pastry sheets filled with different types of meats, vegetables and filled with exotic spices. A personal favourite. This is a very popular Lebanese snack. It is a flatbread filled with cheese and is cooked in a huge oven. Loads of cheese. You can add any vegetable, meats or oils and spices on the top. Did I mention cheese? A traditional Emirati dessert that is a favourite among the residents and the tourists. They are crispy fried balls of dough which are very soft and chewy on the inside. A plate would consist of several of these small balls served with date syrup or honey to serve the otherwise plain balls with a flavour of sweetness. Karak is the national drink of Dubai and can be bought for over just AED 1 at any roadside shop. It is usually served in paper cups and has a very little quantity. It is best enjoyed with a doughnut or any sweet cake on the side. Fareed is a typical meat and potato stew, with a twist. The Arab Bread that the dish is served over brings its charm to the dish apart from it having a range of exotic spices. If Shawarma is every non-vegetarian's favourite dish, then Falefal is a convenient alternative for every vegetarian. Falafel is a deep-fried chickpeas patty. And when this falafel is wrapped in a roll with fresh vegetables and various dressings, magic happens, which is why it is one of the most popular dishes served. This dish's name is inspired by a large wooden spoon that is used in the making of this dish. The wooden spoon is used to beat the batter to get a very thick consistency. Madhrooba is popular during Ramadan and various festivities. The recipe takes a lot of time to prepare which is why it may not be found in a lot of restaurants. However, it is a top choice to make at home as it is healthy, filling and nutritious. After all the flavours, the spices and the main dishes, it is time for some desserts. 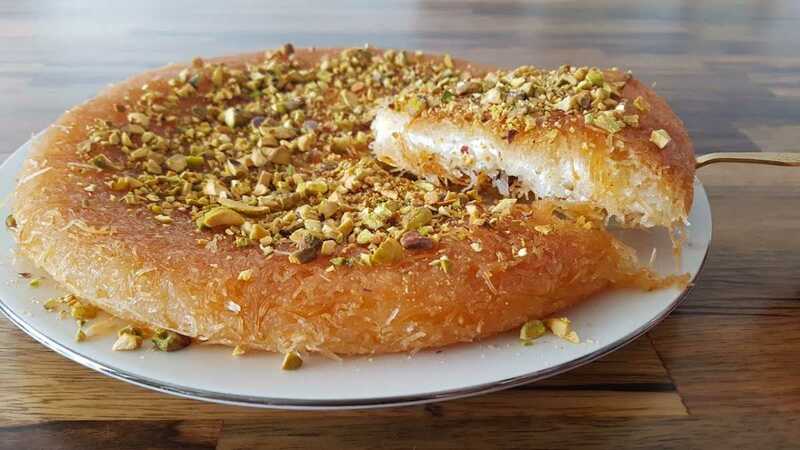 And what better dessert to have than the popularly known as 'Queen of the Desserts'-Knafeh. Served almost at every middle-eastern café or a food-joint, Knafeh is a pastry dish made with only sweet cheese. Toppings include rose-syrup which is served over the dish, and together, it is the gooiest and the most delicious dish you could imagine. Here are some of the best places to enjoy street food in Dubai. Bur Dubai-one of the oldest neighbourhood in Dubai- it is one of the liveliest and busiest parts of the city. Home to mostly Indian expatriates which is why you'd find many Indian streetfood items here along with Arab streetfoods. Streets such as Meena Bazaar street is crammed with many shops selling everything from A-Z as well as a range of cheap and quality food outlets. One of the reasons, Meena Bazaar and Bur Dubai in general ranks at the top of the list for street-food experience is because you get every cuisine and all kinds of specialities if you search hard enough. The perfect street food when you visit the Burj Khaleefa is the Costilla taco at Maiz Tacos Food Truck right opposite to it. And after a spicy Tacos, some delicious Egg and cheese feteer at Zaroob could tickle the taste buds. Satwa is one of the top spots to visit if you plan to go on a hunt for street food in Dubai. Few of the oldest and most iconic eateries opened here and turned into a successful venture opening branches in every locality. For example, Pars Iranian Kitchen which specialises in Persian cuisine, Ravi's which has Pakistani cuisine, Delhi Darbar -as the name suggests- provides Indian cuisine and Al Mallah which specialises in Lebanese and Arabic cuisine. Ravi's is in fact so popular that people from all kinds of nationalities enjoy the food and you will find the restaurant in every locality of Dubai. Al Mallah, on the other hand, remains as one of the most popular stores providing authentic Arab food. It is always filled with customers, so take-out can be a great option or even standing out and having snacks outside the shop on the streets- the way in which it is to be enjoyed. Satwa is where many workers and labourers live, which is why most of the restaurants here offer incredibly cheap but good food. Apart from streetfood sand restaurants offering various cuisines, one can find many dessert stores in Satwa. Many selling excellent sweets for an incredibly low price. It is home to many traditional sweet shops which sell flavoured dates or even chocolate stores. During summers, you would find multiple colourful juice joints opened up selling fresh juices, and special fruit shakes- something that the city takes pride in having. Most of the places open at around 10 AM and stay open until midnight. It can cost up to AED 150 for two individuals. This may seem like a very absurd option, but Global Village assures you get the favourite street food with the authenticity of the actual street-food. Global Village is one of the leading attractions in Dubai. It is a yearly event that runs from late winter months to early summer months. Pavillions of different countries are organised where the specialities of these countries are sold. Apart from food courts, there are various stalls set up across the area. You'd find items like samboosa, shawarma etc. all sold here. There are few stalls where Arab ladies themselves traditionally cook Luqaimat. Visitors naturally surround these stalls just to observe the process, and if you're polite enough, you get a few for free to taste. In a place like Dubai, where culinary from all around the world brings the flavour of the world together, enjoy the food the way it is supposed to be. Best Shawarmas in Dubai For The Foodie in You!